The closure of the Millennium Development Goals (MDGs) in 2015 prompted the need for a book of this kind. An interdisciplinary group of global health scholars contribute to the understanding of the emerging and fast-growing problem of the dual burden of communicable and non-communicable diseases (NCDs) in Africa. This book is timely, as the international community has moved from the MDGs to adopt the Sustainable Development Goals (SDGs) as the blueprint for a new human development agenda. 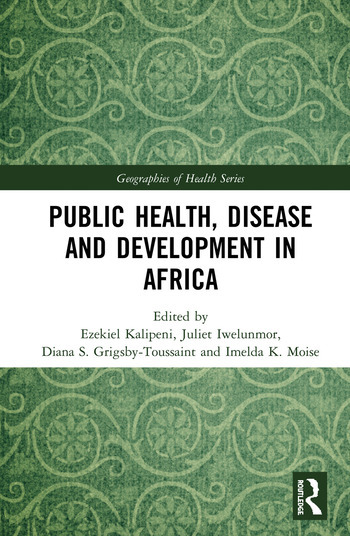 Contributions and case studies are situated in the revised Epidemiologic and Nutrition Transition Model to capture the current situation, referencing communicable and NCDs on the African continent. The case studies encapsulated aim to help minimize negative health outcomes and improve population health, well-being, and equity in the future. This book will be significant in policy circles to assist international organizations, governments, and United Nations agencies. It aims to chart the future for health in Africa in light of recently adopted SDGs. This book is also a useful complementary reader for global public health related courses. Ezekiel Kalipeni is a population and health geographer with research interests in demographic, health, environmental, and resource issues in sub-Saharan Africa. He has carried out extensive research on the population dynamics of Malawi, and Africa in general, including concentrating on the issues of fertility, mortality, migration, and health care. He is currently researching the drivers and consequences of the HIV/AIDS pandemic in Africa. Juliet Iwelunmor is an associate professor at St. Louis University, Missouri. She explores social, cultural, behavioural, and policy factors that influence the health of individuals, families, and communities across the lifespan. She is particularly interested in global health issues, having previously worked as the Culture Sector coordinator for the UNESCO Intersectoral Platform on HIV and AIDS. Diana S. Grigsby-Toussaint is an associate professor in the College of Applied Health Sciences at the University of Illinois at Urbana–Champaign. As a social epidemiologist, she attempts to elucidate how and why socio-environmental factors influence health in local, national, and international contexts. Her research explores the three pillars of health (diet, physical activity, and sleep) on non-communicable disease risk among vulnerable populations by utilizing an interdisciplinary approach spanning epidemiology, geography, and nutrition. Dr. Grigsby-Toussaint's research has been supported by the Robert Wood Johnson Foundation, USDA, and NSF, and her work has been featured in the Chicago Tribune and The Huffington Post. Imelda K. Moise is an applied health geographer and monitoring & evaluation (M&E) specialist, expert in multi-method approaches, community-based participatory research, culturally responsive research, and Geographic Information System (GIS) analysis. Her research focuses on the interface of the social determinants of health, health disparities, and inequities particularly among adolescents and maternal and child health populations, infectious diseases (HIV), and linking research to practice or policy. She also supported USAID-funded health programs in low- and middle-income countries (LMIC) and spent five years in Illinois coordinating federally funded research projects and program evaluation for state agency initiatives and ongoing programs, and six years as a Peace Corps technical trainer in Zambia.